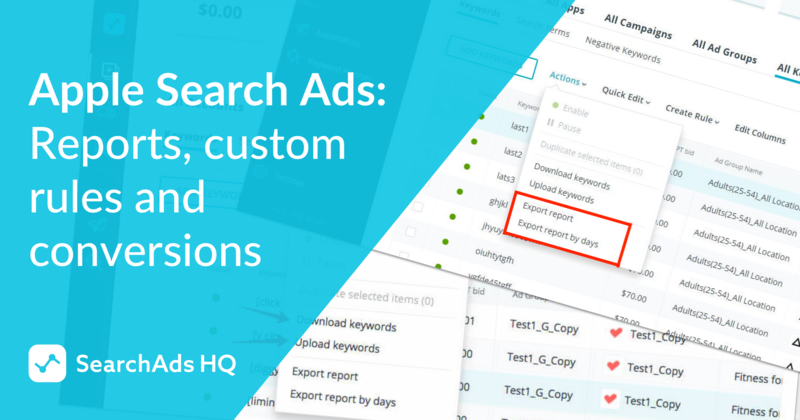 New SearchAdsHQ metrics help mobile marketers to better understand reasons for the discrepancy between the data on ad traffic volume provided by Apple Search Ads itself and mobile trackers (for example, now it’s possible to explain why Installs far exceed Downloads). These metrics are essential if you want to properly measure the efficiency of app advertising. They provide more comprehensive information presenting a complete picture which leads to better optimization of Apple Search Ads. LAT Off Downloads Share – the metric specifies what percentage of the total downloads number is represented by LAT Off Downloads. The first 4 metrics (LAT On Downloads, LAT Off Downloads, New Downloads and Redownloads) are taken from Apple directly. 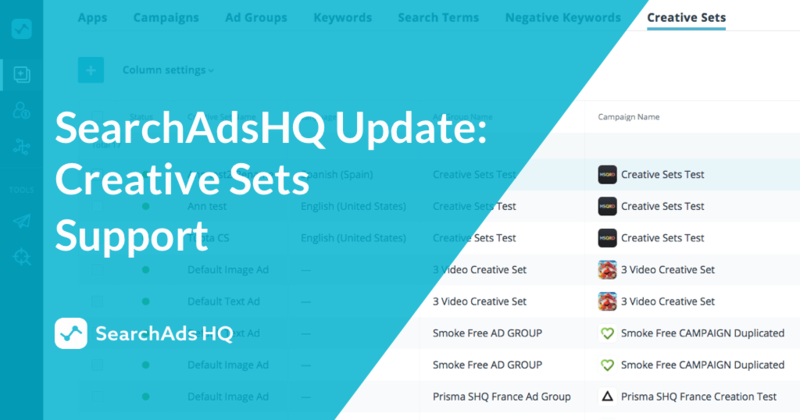 However, mind that SearchAdsHQ uses the term ‘Downloads’ instead of Apple’s ‘Conversions”. 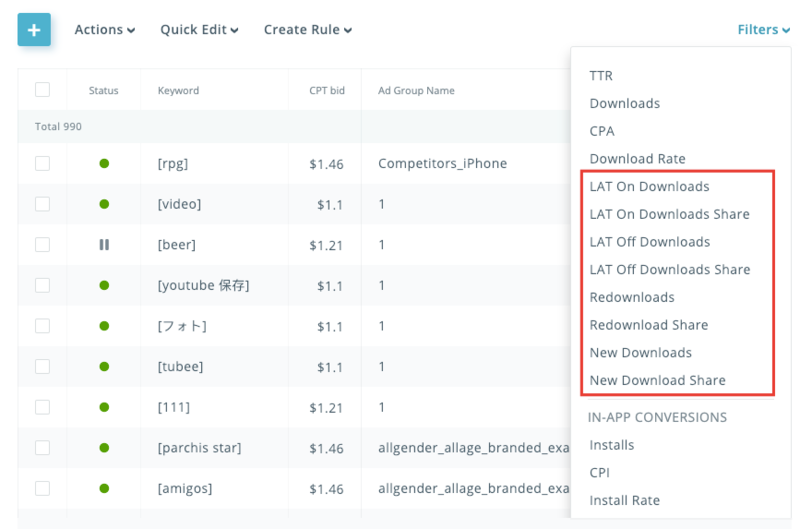 The rest of the metrics (New Downloads Share, Redownloads Share, LAT On Downloads Share and LAT Off Downloads Share) can’t be found on your App Store ads dashboard as they’re calculated by SearchAdsHQ based on the data from Apple. Rules – you can use Apple Search Ads discrepancy metrics as conditions for automated rules in SeachAdsHQ. There is a range of differences in how Apple and mobile trackers register traffic from the App Store ads. In general, MMPs don’t consider a sizeable portion of Apple Search Ads traffic which results in the distortion of such important metrics as number of Installs, average cost-per-action (CPA), ROAS, Revenue, etc. These very metrics are used by mobile marketers for the evaluation of Apple Search Ads efficiency and its optimization. 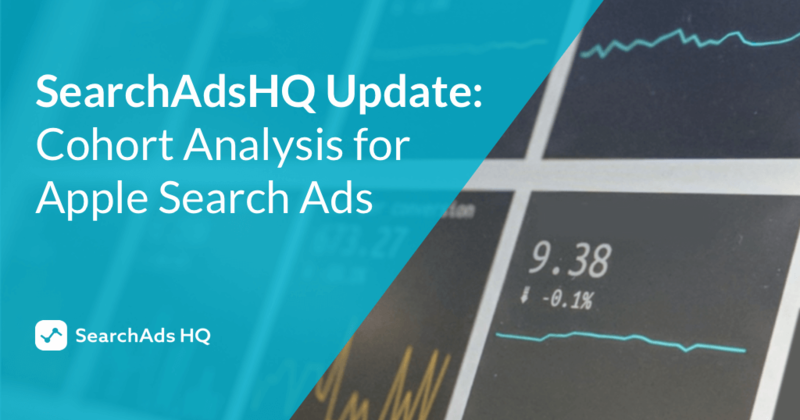 New SearchAdsHQ metrics help you understand the reasons behind statistical discrepancy and calculate more accurate metrics for the App Store ads performance if necessary. Let’s consider 2 basic discrepancy reasons and how you can deal with them using SearchAdsHQ metrics. 1. Mobile trackers can’t distinguish users with activated Limit Ad Tracking (LAT) option. If a user with activated LAT installed an app after clicking on Apple Search Ads, they won’t be attributed to this traffic source by a MMP. As a result, users may use an app but these events are not reflected in Apple Search Ads statistics of a mobile tracker. LAT On/ LAT Off metrics provided by SearchAdsHQ let you see how much traffic could’ve been not attributed to Apple Search Ads in the statistics of your mobile tracker due to activated Limit Ad Tracking. 2. The majority of MMPs don’t work with Redownloads correctly. The thing is mobile trackers don’t treat Redownloads as new downloads and keep attributing all events associated with them to a traffic source which brought the initial download. Thus, a publisher pays for an ad which brings a user who was their client once (and deleted the app at some point) but their mobile tracker doesn’t consider such traffic. SearchAdsHQ metrics Redownloads/New downloads help you understand how much traffic could’ve been not reflected in Apple Search Ads statistics of a MMP as some downloads were repetitive. Let’s deconstruct a simple example to see how it works. Thus, we can conclude that there’s a possibility that at least 25 downloads (and 45 downloads at maximum) were converted into Installs after all. However, the tracker didn’t consider this data in its statistics. The evaluation of Apple Search Ads performance based on new numbers is way more impressive, isn’t it? 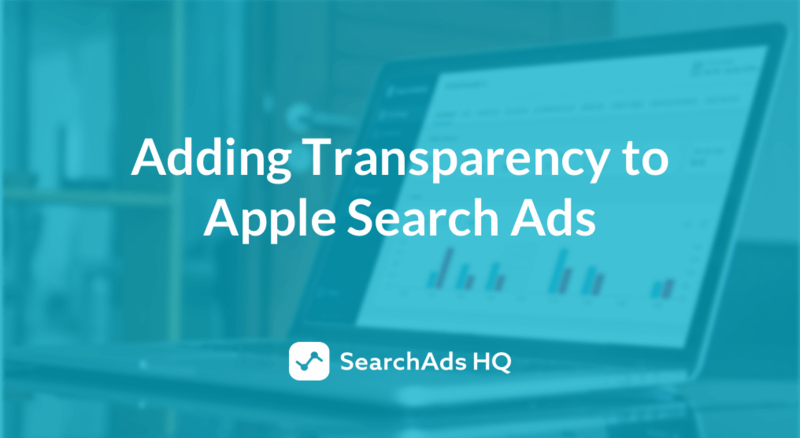 As the above-mentioned example demonstrates, SearchAdsHQ update lets you see the full picture of Apple Search Ads performance and evaluate its efficiency. The introduction of new metrics is yet another step to creating the best platform for the App Store ads management which helps you scale profitability of Apple Search Ads and earn more doing less.